Toast to your good fortune with our personalized shot glass favors. These unique favors are a lasting memento of your new arrival. Available in a variety of different themes and colors, you can customize the printing with your choice of text as well. 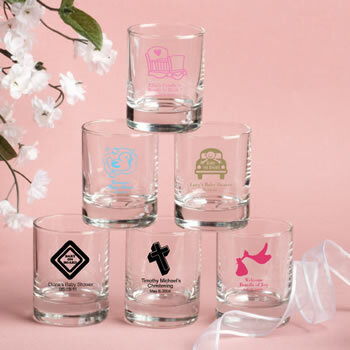 The personalized shot glass favors are 3oz round glasses that can also be used to hold votive candles. Whatever way you use them, the glasses are a wonderful keepsake for friends and family. I ordered 225 shot glasses for my wedding party favors and was worried about it arriving on time. I emailed the company and someone emailed me back the next day. Not only that but the estimate arrival button was very helpful as well. It arrived very quickly, on the day it said it would, and undamaged. The shot glasses are better than I thought and I love them. I would definitely order from them again! I'm very happy with the service and product. Thank you! I was surprise that all my shot glasses were intact! No broken glass!! The next surprise was the shot glasses are thick and a great size! Wow great quality. I also purchased the boxes which adds classy appearance plus there are bows u can place on box. The product turned out beautifully; little disappointed that some of the lettering was missing; I believe items should have been reviewed more carefully prior to shipment. They arrived in a timely manner. Overall, I’m satisfied. The shot glasses were perfect. I loved the size and the print. It was also a hit at my baby shower. As soon as my guest saw them they started to use them. Will be ordering from nice price favors in the future. Awesome product....customer service outstanding....Will buy from them again! got the glasses really fast and none was broken...they look great. can't wait to use them at the rehearsal dinner. Beautiful is all i can say. the guests loved them. I ordered these with the packaging for my sister's baby shower, and they are so cute, I love them! This favor really fits the occasion and it will be filled with chocolate candy kisses in pastel colors, wrapped in clear cellophane and tied with a matching color curly ribbon. This is a favor for many uses including candles, stuff, etc. It also did pass the dishwasher test even though it is not recommended. I was just curious. I ordered 80 glasses for my baby shower. They arrived at a good time but several had smeared ink. I contacted them and they wanted to use their damage disclaimer to justify someone placing smeared shot glasses in the box to be shipped. I would have understood if they got damaged (broken etc.) after being shipped. These was smeared before then and they refused to replace them.They offered me blank glasses or $3 back. After I paid for my order over $100 and paid their service charge and their high shipping rates. From NicePriceFavors: I'm so sorry that you 3 of your 80 glasses were not printed properly. We do mention the potential for damage directly on the product page on our web site. We ask that you order a few extra for just such a contingency. While most orders arrive 100% in tact and properly printed - there are a very small percentage where there are issues. These favors were perfect keepsakes for my baby shower guests. Completely satisfied. Arrived early and safely packaged. The favors came right on time & perfectly as ordered. Everyone loved them & thought they were a practical gift. They are very well made too. We bought around 45 and overall the quality is great, we had a custom text printed on to the glasses and around 5 of them had a little bit of smeared ink or scratched letters. 7 of them came broken. Packaging could be better, even though they place red stickers with warnings, shipping companies might not handle them with care. We are overall pleased with the product. The shot glasses are perfect. Got them with no pic, just names & dates in a simple gold and they looked beautiful. I had an overall great experience with the company. The items came when they were supposed to and were inexpensive. However the shipping company did not take good care of the package because when I got the box it was damaged and there were 5 shot glasses broken in side. I was a little disappointed. I might have to order more. candles arrived exactly on time...look awesome,well done!